Three USC professors were announced today as new fellows of the National Academy of Inventors, an elite group of innovators that includes 21 Nobel laureates from around the world. 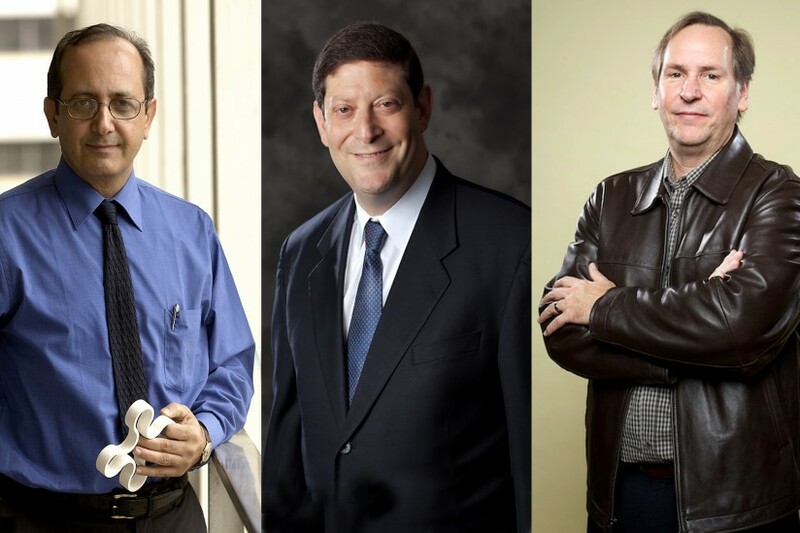 USC’s Mark Thompson, Behrokh Khoshnevis and Alan Willner will be inducted into the three-year-old organization in a ceremony at the California Institute of Technology on March 20. “USC’s fellows are not just outstanding researchers, but they also have the rare talent to produce innovations that help people in their everyday lives,” said Randolph Hall, USC vice president of research. The professors join USC President C. L. Max Nikias, who was inducted as a charter member in 2012. The total number of NAI fellows now stands at 414, including 21 inductees to the National Inventors Hall of Fame, 16 recipients of the National Medal of Technology and Innovation and 10 recipients of the U.S. National Medal of Science. The new fellows, who will be inducted by Andrew Faile, deputy U.S. commissioner for patent operations for the U.S. Patent and Trademark Office, were chosen because they “demonstrated a highly prolific spirit of innovation in creating or facilitating outstanding inventions that have made a tangible impact on quality of life, economic development and the welfare of society,” according to a statement from the NAI. If you own a Samsung phone with an organic light-emitting diode screen, you can thank Thompson for the device’s dazzling colors. Thompson, a chemist at USC with joint appointments at the USC Dornsife College of Letters, Arts and Sciences and the USC Viterbi School of Engineering, develops new materials and is perhaps best known for his work on OLED screens. He and his lab invented the molecules that make the colors red and green show up on the phone’s screen and are now working on white and blue. This award shows that this aspect of our efforts is certainly being noticed. Since joining USC in 1995, Thompson has earned numerous accolades, including being named the 1998 Distinguished Inventor of the Year by The Intellectual Property Owners and later being ranked 12th on Thomson Reuters’ Science Watch list as one of the world’s most influential chemists of the past decade in 2011. In addition to his work on OLEDs, Thompson is re-envisioning solar power by developing organic solar cells that would be ultra lightweight, flexible and durable — and competitive with the more established, older designs. From outer space to the inside of your mouth, research by Khoshnevis is reinventing the way that machines build the necessities of life. Khoshnevis, a professor at USC Viterbi and director of the Center for Rapid Automated Fabrication Technologies, is best known for Contour Crafting, his robotic construction system that 3-D prints buildings. 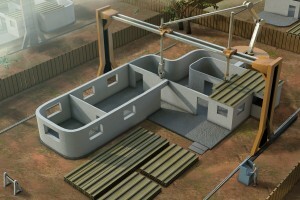 The current design has the potential to print a modest-sized, 2,500-square-foot home in about 18 to 19 hours with a crew of about four people. He is currently working with NASA to design a Contour Crafting system capable of creating structures on the Moon or even Mars. In addition, he has three National Science Foundation projects working on 3-D metallic printing, and he’s just launched a project to develop a robot that can bend orthodontic wires perfectly molded to an individual’s mouth. Ever since I was a kid, I wanted to be a famous inventor. Seven years ago, Khoshnevis started teaching “Invention and Technology Development,” a graduate-level engineering course to train the next generation of inventors. His students — primarily from the engineering and business schools — routinely call it a “life-changing experience” on end-of-term evaluations. “I try to teach the students to look inside to see what you have to give,” he said, “not to look outside to see what you can take. Willner, a professor at USC Viterbi and director of the USC Optical Communications Laboratory, credits “luck and pluck” for his career in science. One of the defining moments charting Willner’s course was the opportunity to work with early optical communications pioneers Tingye Li and Ivan Kaminow at Bell Labs in the late 1980s, then the hotspot for the field at a time when it was starting to take off. Those two pillars of the field became his mentors, collaborators and friends. Recruited by USC in 1992, Willner’s research on increasing data transfer through optical fibers aided the growth of the field and earned him a string of honors and accolades, including the IEEE Eric Sumner Technical Field Award; the Presidential Faculty Fellow Award from the White House; Guggenheim, Packard and Fulbright Foundation fellowships; and election as an international fellow of the U.K.’s Royal Academy of Engineering. My colleagues here are fantastic, and I have the ability to collaborate with top researchers. Willner recently has experimented with twisting light beams and, separately, twisting radio beams to send data at unheard-of speeds. His transmission experiments with the twisted light reached speeds of up to 2.56 terabits per second. It sounds like science fiction, but Willner said that USC’s open and stimulating environment has allowed him to explore and push the boundaries of what’s possible in his field. 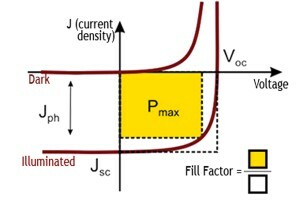 Mark Thompson's team has worked with organic solar cells. Mark Thompson and Karl Christe are slated to accept American Chemical Society awards in 2015. Alan Willner’s engineering team reached data transmission rates of 32 gigabits per second in a USC lab. USC Viterbi School of Engineering Professor Alan Willner has been elected vice president of The Optical Society.